As a ‘starter in life’, I have always been grateful to Ikea for providing classy, cozy and functional furnitures at low prices. I am a huge fan, at a point that most of the times I need anything I turn myself towards Ikea even before checking what else there can be out there. Dropping out of school in late 2010, I had only a few days to find a flat and get furnitures in Nantes before starting working at Advansee. I went to Ikea, rented a small truck and ten hours later I had a full Ikea house (from the very fork and spoon to the bed/matress). As fool as it may sound, I had spared money for the three last years in order to have a 'proper' house when starting in life. The main reason is that I am kind of a 'home' guy, but this is another story. . . In the middle of the huge list of items, there was this corner couch. 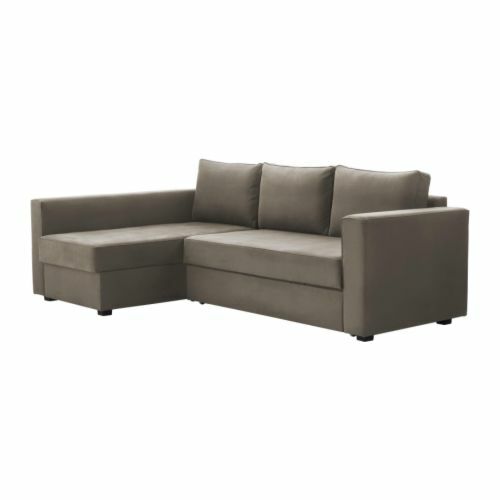 Even though the price is 100 $ cheaper in France; it can sound quite expensive for a couch, especially for a freshly graduated student. The chaise contains a huge trunk, where I can fit all my bed sheets, duvet and pillows and even my bath towels (and occasionally some Christmas presents). The couch itself can be transformed into a 2 people (160x200) bed in less than 5 seconds (let's say 10 if you have guys with a bier in the hand already sitting there). It ships into 3 packages, each exactly fitting into a 4 people (french) car. No need to be delivered if you are a bit patient and agree to do it in three rows. Same Ikea couch, ready to receive! The couch is really smooth, the trunk really huge and the bed awesome (no "ouch my back hurts like hell!" when getting up in the morning). I even had my 70 year old grand-parents and then slept like babies. So when summarizing, for the price of a couch I get a couch, a guest bed and a chest. Who still says it is expensive ? But the story does not end there ! After one year and a half in France, my girlfriend and me decided to leave the country (working abroad gets really addictive once you tried it :) ) So we found a job in the Netherlands. We left in such a rush due to several reason I had to sell all my furnitures in one month. . . and even my lovely couch. It was by far the item I loved most in my flat (even before my computer). Several months later, finally both having a job and settled in a proper flat; we could think about getting new furniture. I was decided to look everywhere but Ikea for my new stuff this time (never good to always stick to the same habits). So I searched on the web and in stores for several weeks, but still having my old lovely couch in mind. . . I finally went to the Ikea's website . . . to learn that the price of my couch had dropped by 130 $ ! Where in the first version of the couch you had to choose where you want your chaise, everything is now symmetrical, and you choose where to place it as you build the furniture. What does it mean for Ikea ? Ikea now has only one product to store instead of 2. Storage space is saved, and I guess several errors from customers avoided. Ikea obviously saves money by reducing the number of elements to manufacture. Instead of two sets of couches, it is now only one with twice the production volume. I expect the manufacturing costs to drop dramatically. Well, they got me there I must say. There was only one thing left to do : buy the couch (and change color this time :)). Ikea always impressed me by the cleverness they use to reduce their prices (like creating the cheapest table ever. The table is in fact filled with paper and wood is used only for the external part); but what amazes is that they actually echo these price cuts to their customers ! Ikea, you have all my respect (and my love). Special kudos for Julien and Gaelle for helping out so much with the couch. Design, Innovation and Hacking in a couch was published on May 29, 2012 by Julien Lengrand-Lambert.